Welcome to Mountain View Veterinary Clinic! Located in beautiful Hayden, Idaho, Dr. Bob Erickson, Dr. Chaley Rider and the staff of Mountain View Veterinary Clinic are committed to your pet's health. At Mountain View Veterinary Clinic we strive to exceed your expectations in the quality of our Veterinary medicine. 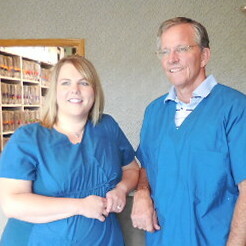 Since 1994, Bob Erickson and our staff have practiced compassionate small animal veterinary care in the Hayden area. Mountain View Veterinary Clinic is a full-service animal hospital whose mission is to provide the highest standard of primary veterinary care for your pets. Specialists are readily available in Spokane and Pullman for consult and referral when needed. We provide friendly, informative, and supportive services for you and your pet. Mountain View Veterinary Clinic offers the Hayden and surrounding area access to emergency veterinary services as well as routine medical, surgical, and dental veterinary care. Long-standing relationships with ethical on-line veterinary pharmacies and local compounding pharmacists in addition to our own in-house pharmacy, means convenience and flexibility in meeting our patients' medication needs.